â˜˜ St. Pattyâ€™s Day â˜˜ For me, it's always been all about the pub grub ðŸ�”, the beer ðŸ�», and the all green errrryythang ðŸ�€. It's also my grandfatherâ€™s birthdayâ€¦ ðŸŽ‰ So, every year we've always had a good excuse to celebrate! I've spent a lot of St. Patrick's Days at local pubs and bars drinking beer and scarfing down lots of heavy, greasy bar food--the kind that tastes so so good, but makes you feel sorta like you got hit by a truck afterwards. This year, I decided to pay homage to my Irish roots (partial roots anyway, but enough to have blessed my baby girl with a head full of red hair ðŸ˜‰) this year and come up with a less greasy, not fried version of some good, old-fashioned pub food. And in true St. Patrickâ€™s Day (and Minnie Chef) spirit, I made things even more green ðŸŒ±. Can I get a kale yeah!? So, hereâ€™s a recipe for some plant-based Bangers & Mash that wonâ€™t send you into a food coma! Mashed potatoes sans butter and cream, with a hint of light freshness from lemon and thyme, topped with sweet, rich caramelized onions, served along side some sauteed grain meat sausage and kale. It's the perfect St. Patty's Day meal that won't leave you wishing you hadn't eaten it after! 3 5 mins. 45 mins. 50 mins. Place a medium pan over low heat. Peel onion, cut in half lengthwise and thinly slice. Add 1 tablespoon olive oil and onion slices to the pan. Season with a pinch of salt. Cook onions over low heat for about 45 minutes, or until brown, stirring occasionally. Wash potatoes, peel if desired, and cut into quarters. Place potatoes in a medium saucepan and cover with about an inch of cold water. Place saucepan over medium heat. Bring to a boil, reduce heat to low and simmer, uncovered, for about twenty minutes until potatoes are tender. Once potatoes are tender, drain and return them to saucepan. Using a potatoe masher, roughly mash potatoes. Add almond milk, nutritional yeast flakes, 1 tablespoon of olive oil, 1 teaspoon garlic powder, Â¼ teaspoon salt, Â¼ teaspoon black pepper, parsley, thyme, and lemon juice to the potatoes. Mash potatoes until everything is incorporated. Place a large pan over medium heat. Add remaining olive oil and sausages to the pan (make sure to remove plastic casing). 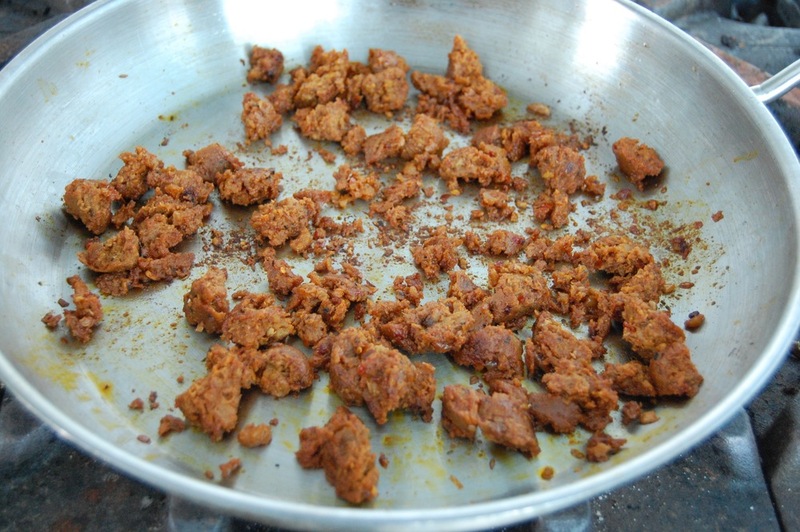 Use a spatula or wooden spoon to crumble the sausages. Cook, stirring frequently, for 2-3 minutes. Add kale, remaining garlic powder, salt and pepper to the pan and cook, tossing frequently, for another few minutes until kale begins to wilt. 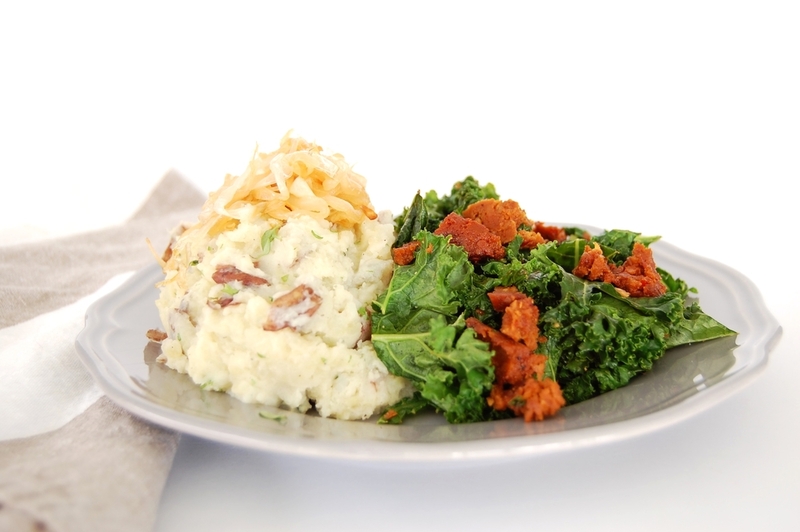 To serve, top mashed potatoes with caramelized onions and serve alongside the sausage and kale. Enjoy! The Mexican Chipotle sausage is pretty spicy, so use a different flavor (or leave it out) for yout little one!